Cloudy with a Chance of Meatballs centers on the life of Flint Lockwood, an aspiring inventor who has failed with his creations in more ways than one. What may add fuel to the fire is the growing concern of the people of Swallow Falls over Baby Brent Sardine Cannery due to its shortage of food supply. Flint on the other hand invented the FLDSMDFR (Flint Lockwood Diatonic Super Mutating Dynamic Food Replicator), with hopes of proving his worth to everyone and solving the town’s problem at the same time. What would occur next would be, well, lots of raining chows. The audience’s imagination will run freely from the title of the movie alone. Flint’s heroic actions and achievements more than make up for his transparency, making the audience root for the guy even more than they should. There are plenty of characters providing comic relief for the film, including Steve the Monkey, Brent McHale, and Joe Towne. The awards season is right around the corner, and frankly we think Cloudy has one of the most interesting screenplays for an animated movie, if only it isn’t based on a children’s book. The film doesn’t necessarily provide so much attention to detail, but the plot itself is simple enough for anyone to understand. But more than anything, the message is clear. Lessons aside, Cloudy leaves a lot to the imagination and will leave you wondering what it’s like to be in Flint’s situation. Sure enough, the idea of food raining down on everyone is a dream come true for every nation in this world. It’s just so much fun for anyone to imagine the good side of that scenario, don’t you think? Cloudy’s characters feature voices from Bill Hader (Saturday Night Live), Anna Faris (The House Bunny), Neil Patrick Harris (How I Met Your Mother), and James Caan (The Godfather). 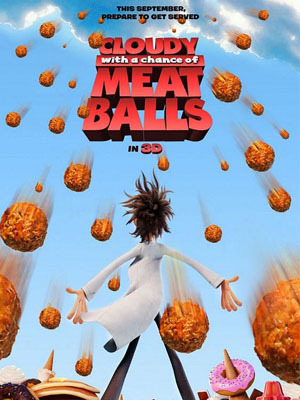 Cloudy with a Chance of Meatballs opens January 27 at cinemas everywhere. FHM's take on the 67th Golden Globes!